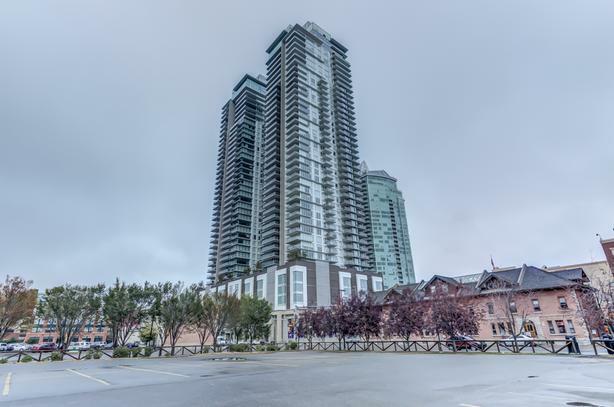 Welcome to this fabulous 2 bedroom, 2 bathroom apartment with stunning views of the Saddledome, downtown and Calgary Tower located in the popular Guardian south tower. This immaculate home is bright and airy with its floor to ceiling windows, modern decor & a private west facing balcony....relax and enjoy the stunning views! This home benefits from Blomberg and AEG appliances, stunning white kitchen with large island & white quartz. The Master bedroom has awesome west views,double closets & a 4 piece ensuite with deep soaker tub. The spacious 2nd bedroom has south facing views to overlook the Saddledome. The family room is a great place to enjoy both aspects of views as well as appreciate the ambiance of this gorgeous apartment. There is also tandem parking, insuite laundry & a storage locker too! The complex has a fitness room,residents patio & lounge,a woodworking room,concierge & security. All this in a great location just a short walk to C train, Cowboys, Stampede park....don't miss out view today!